Today we’re back with our monthly analysis of the Westchester County real estate market. We last checked in on Westchester with our 2018 Year in Review Market Watch, which you can read here. 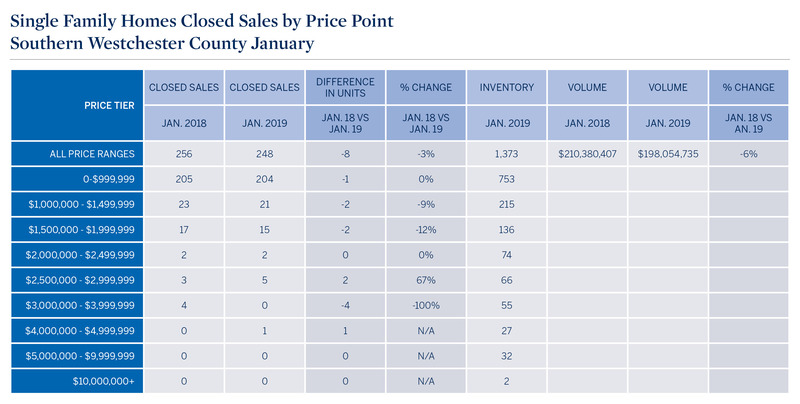 First quarter to date finds the county performing similarly to how it performed throughout 2018, with modest declines in unit sales and dollar volume versus the prior year. 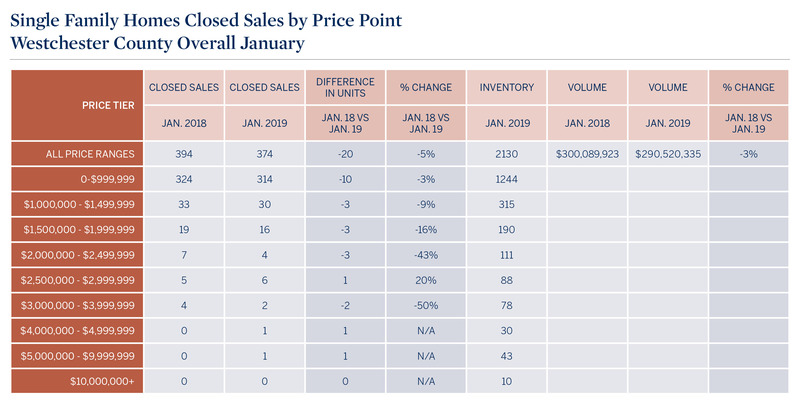 The charts below illustrate sales results in Westchester across multiple price ranges in the county overall, the southern county and the northern county, for the period from January 1 to January 31, 2019. All data is provided by the Hudson Gateway Multiple Listing Service. We will continue to deliver a more highly detailed review in our quarterly reports. We hope you find this information valuable in evaluating your own real estate needs, and invite you to contact one of our sales associates if we can assist you in any way. Year to date, Westchester is down 5% in unit sales and 3% in dollar volume compared to January 2018. The county was off by just 20 units, down from 324 to 314, and about $10 million in volume. In the southern county, unit sales declined by 3% year over year, a difference of only 8 units with 248 sales closing in January versus 256 last January. Dollar volume declined by 6%, or approximately $12 million. In the northern county, unit sales decreased by 9%, or 12 units, year over year, with 126 closings in January 2019 versus 138 in January 2018. However, dollar volume increased a slight 2%.